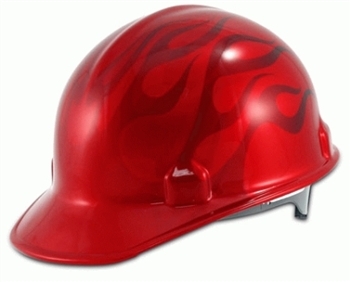 Jackson hard hats offer protection that allows workers to express their own style. A deep red base is brought to life with graphic flames burning from front to back. Jackson hard hats are fully dielectric and designed to withstand temperature variances, humidity, and exposure to UV light for long-lasting wear. Jackson hard hats feature a fully adjustable ratchet suspension with replaceable sweatband that fits head sizes between 6 1/2 and 8. Meets ANSI Z89.1 standards.